In three new studies, astronomers discuss the three unusually long-lasting stellar explosions that were discovered by NASA’s Swift satellite and represent a previously unrecognized class of gamma-ray bursts. Three unusually long-lasting stellar explosions discovered by NASA’s Swift satellite represent a previously unrecognized class of gamma-ray bursts (GRBs). Two international teams of astronomers studying these events conclude that they likely arose from the catastrophic death of supergiant stars hundreds of times larger than the sun. The astronomers discussed their findings Tuesday at the 2013 Huntsville Gamma-ray Burst Symposium in Nashville, Tennessee, a meeting sponsored in part by the University of Alabama at Huntsville and NASA’s Swift and Fermi Gamma-ray Space Telescope missions. “We have seen thousands of gamma-ray bursts over the past four decades, but only now are we seeing a clear picture of just how extreme these extraordinary events can be,” said Bruce Gendre, a researcher now associated with the French National Center for Scientific Research who led this study while at the Italian Space Agency’s Science Data Center in Frascati, Italy. Prior to Swift’s launch in 2004, satellite instruments were much less sensitive to gamma-ray bursts that unfolded over comparatively long time scales. 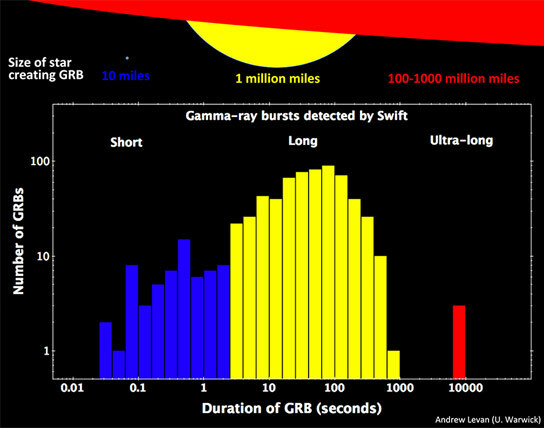 Traditionally, astronomers have recognized two GRB types, short and long, based on the duration of the gamma-ray signal. Short bursts last two seconds or less and are thought to represent a merger of compact objects in a binary system, with the most likely suspects being neutron stars and black holes. Long GRBs may last anywhere from several seconds to several minutes, with typical durations falling between 20 and 50 seconds. These events are thought to be associated with the collapse of a star many times the sun’s mass and the resulting birth of a new black hole. Gendre and his colleagues made a detailed study of GRB 111209A, which erupted on Dec. 9, 2011, using gamma-ray data from the Konus instrument on NASA’s Wind spacecraft, X-ray observations from Swift and the European Space Agency’s XMM-Newton satellite, and optical data from the TAROT robotic observatory in La Silla, Chile. The burst continued to produce high-energy emission for an astonishing seven hours, making it by far the longest-duration GRB ever recorded. The team’s findings appear in the March 20 edition of The Astrophysical Journal. Another event, GRB 101225A, exploded on Christmas Day in 2010 and produced high-energy emission for at least two hours. Subsequently nicknamed the “Christmas burst,” the event’s distance was unknown, which led two teams to arrive at radically different physical interpretations. One group concluded the blast was caused by an asteroid or comet falling onto a neutron star within our own galaxy. Another team determined that the burst was the outcome of a merger event in an exotic binary system located some 3.5 billion light-years away. “We now know that the Christmas burst occurred much farther off, more than halfway across the observable universe, and was consequently far more powerful than these researchers imagined,” said Andrew Levan, an astronomer at the University of Warwick in Coventry, England. As a part of this study, which is described in a paper submitted to The Astrophysical Journal, Levan’s team also examined 111209A and the more recent burst 121027A, which exploded on Oct. 27, 2012. All show similar X-ray, ultraviolet and optical emission and all arose from the central regions of compact galaxies that were actively forming stars. 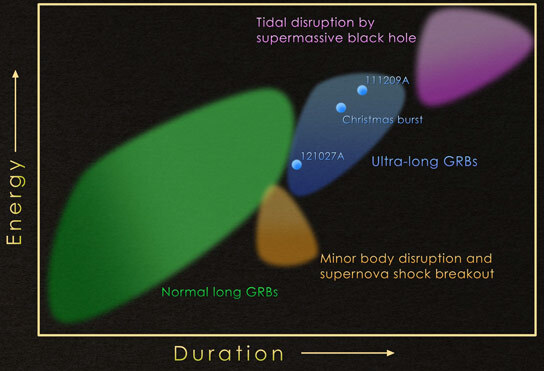 The astronomers conclude that all three GRBs constitute a hitherto unrecognized group of “ultra-long” bursts. 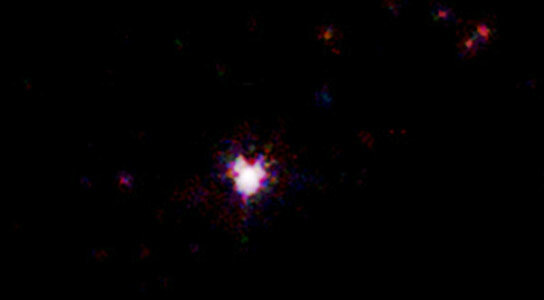 To account for the normal class of long GRBs, astronomers envision a star similar to the sun’s size but with many times its mass. The mass must be high enough for the star to undergo an energy crisis, with its core ultimately running out of fuel and collapsing under its own weight to form a black hole. Some of the matter falling onto the nascent black hole becomes redirected into powerful jets that drill through the star, creating the gamma-ray spike, but because this burst is short-lived, the star must be comparatively small. “Wolf-Rayet stars fit these requirements,” explained Levan. “They are born with more than 25 times the sun’s mass, but they burn so hot that they drive away their deep, outermost layer of hydrogen as an outflow we call a stellar wind.” Stripping away the star’s atmosphere leaves an object massive enough to form a black hole but small enough for the particle jets to drill all the way through in times typical of long GRBs. Because ultra-long GRBs persist for periods up to 100 times greater than long GRBs, they require a stellar source of correspondingly greater physical size. Both groups suggest that the likely candidate is a supergiant, a star with about 20 times the sun’s mass that still retains its deep hydrogen atmosphere, making it hundreds of times the sun’s diameter. 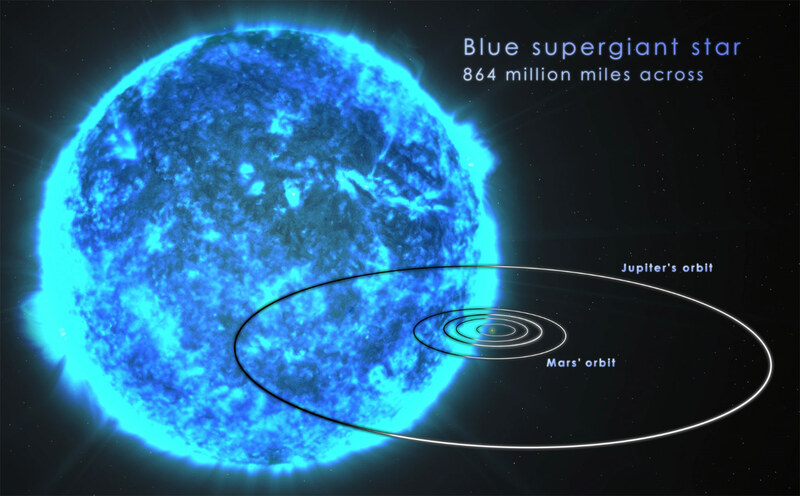 Gendre’s team goes further, suggesting that GRB 111209A marked the death of a blue supergiant containing relatively modest amounts of elements heavier than helium, which astronomers call metals. “The metal content of a massive star controls the strength of its stellar wind, which determines how much of the hydrogen atmosphere it retains as it grows older,” Gendre notes. The star’s deep hydrogen envelope would take hours to complete its fall into the black hole, which would provide a long-lived fuel source to power an ultra-long GRB jet. Metal content also plays a strong role in the development of long GRBs, according to a detailed study presented by John Graham and Andrew Fruchter, both astronomers at the Space Telescope Science Institute in Baltimore. Stars make heavy elements throughout their energy-producing lives and during supernova explosions, and each generation of stars enriches interstellar gas with a greater proportion of them. While astronomers have noted that long GRBs occur much more frequently in metal-poor galaxies, a few of them have suggested that this pattern is not intrinsic to the stars and their environments. To examine this possibility, Graham and Fruchter developed a novel method that allowed them to compare galaxies by their underlying rates of star formation. They then examined galaxies that served as hosts for long GRBs and various types of supernovae as well as a control sample of 20,000 typical galaxies in the Sloan Digital Sky Survey. The astronomers found that 75 percent of long GRBs occurred among the 10 percent of star formation with the lowest metal content. While the study found a few long GRBs in environments with high-metal content, like our own galaxy, these occur at only about 4 percent the rate seen in low-metal environments per unit of underlying star formation. The astronomers suspect this pattern reflects a difference in how well a massive star manages to retain its rotation speed. Rising metal content means stronger stellar winds. As these winds push material off the star’s surface, the star’s rotation gradually decreases in much the same way as a spinning ice skater slows when she extends her arms. Stars with more rapid rotation may be more likely to produce a long GRB. Graham and Fruchter hypothesize that the few long GRBs found in high-metal environments received an assist from the presence of a nearby companion star. By feeding mass — and with it, rotational energy — onto the star that explodes, a companion serves as the physical equivalent of someone pushing a slowly spinning ice skater back up to a higher rotational speed. › Paper: “The Ultra-long Gamma-Ray Burst 111209A: The Collapse of a Blue Supergiant?” B. Genre et al. › Paper: “A new population of ultra-long duration gamma-ray bursts.” A.J. Levan et al. › Paper: “The Metal Aversion of LGRBs.” J. F. Graham and A. S. Fruchter. Be the first to comment on "NASA’s Swift Discovers Three Unusually Long-Lasting Stellar Explosions"